Meet Earthy Babes, Brooklyn’s latest up-and-coming Psychedelic Indie Rock band. Now, you might be thinking, “What’s new? There are a gazillion of those”, and yeah, that’s true, but I dig these guys. Listening to their two 2012 EP’s Still Earthy and Struggle Remains is a pleasant experience, and somehow, I feel like I haven’t heard something quite like this in awhile. So, I’d advise you to catch them at Mercury Lounge, tomorrow night, February 20th, at 10:30pm. Justin, when and how did you and Tyler meet? When did you meet the other people in your band? Justin: Tyler (lead vocals) and I (guitar, vocals) met each other about 8 years ago playing in bands around the Lawrence, Kansas area. We were fans of each other’s I suppose and stayed in touch. We both ended up moving to Brooklyn, and we started recording the first EP, ‘The Struggle Remains’ in January 2011. Initially I was to produce and engineer his songs, but the band has developed into a partnership where every step of the creative process is blurred and shared. We’ve had some success with licensing our songs and started to play around with the idea of performing live last fall. Tyler recruited our friends Michael King (keys), Josh Hoffman (drums), and Trevis Stewart (bass guitar) to fill out the lineup and off we went. Tomorrow’s Mercury Lounge show will be our fifth show. Is this your full time gig? Or are you working on other things right now? Justin: All of us have day jobs. Tyler’s a film editor and I’m a live sound engineer. 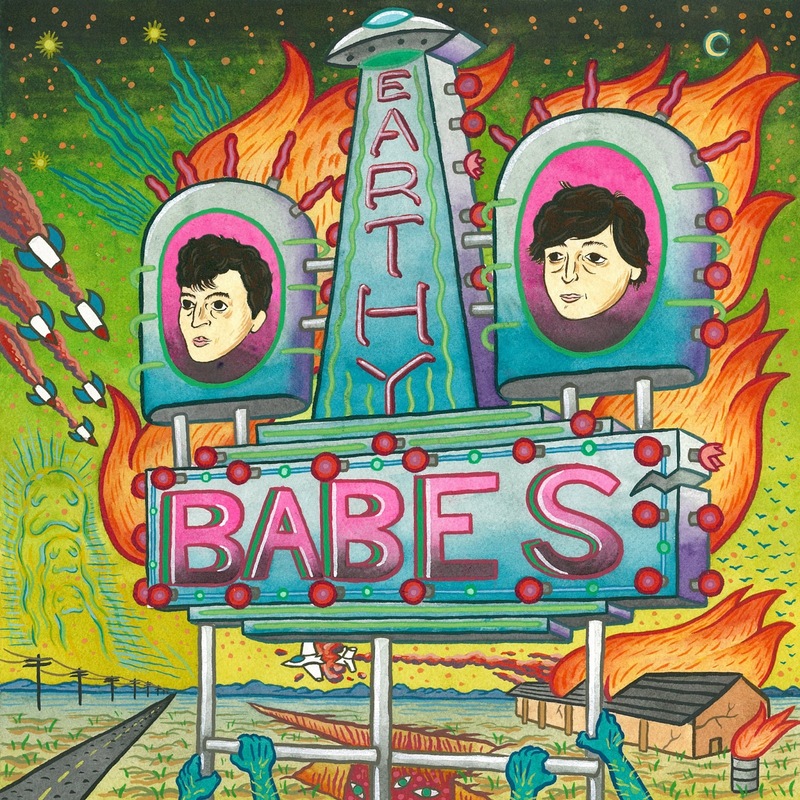 We’ve resolved to make Earthy Babes our sole focus musically for the foreseeable future. What do you hope to accomplish in music in the next couple years? Justin: Just keep up the pace of recording that we’re on and expand the sound organically. We’re all interested in different things, so it will be cool to see what direction things go. We’re in no rush, we’ve made some mistakes in previous bands and want this project to unfold in the right way. I record music almost every day and have been for years. I just wanna wake up everyday and record and write if my financials allow me to. Treat making music like a job. Show up, put in my time whether I feel like it or not, then head home. Influences? Favorite bands/artists? Who are you listening to right now? Justin: I can’t speak for the rest of the guys, but I’ve been loving these two volumes of Minimal Wave music a friend sent to me. Tame Impala’s new record is amazing. Love everything that Here We Go Magic has ever done. PVT’s Homosapien is on repeat at my house nowadays. Then also, I tend to fall in the love with the bands I mix and tour with. A little bit of Stockholm syndrome in there somewhere. Tell me about your relationship with the NYC music scene. Justin: I’ve been ingrained thoroughly before in both the Seattle (where I lived for three years before moving to NYC) and Lawrence music scenes. I guess it feels a little different here. But bands are bands. There are selfless artists, egotistical scene-sters, and everything in between. I like hanging out with musicians that can have a conversation about something other than their own band. Every music scene across the country feels the same to me now. As a local band in NYC, the only positive I guess is you don’t have to tour. Most bands tour so they can come to NYC. You recently opened for Clap Your Hands, Say Yeah. Brooklyn Bowl right? Thoughts on the venue? Justin: Yes we did. Full disclosure: I’ve worked for CYHSY as their Front-Of-House engineer and I’m a lead engineer at Brooklyn Bowl. So in saying that, I think Brooklyn Bowl is an amazing thing to have in your city. They really treat bands and patrons with respect and its uniform across the board too. Little bands and giant underplays will get the same degree of attention. It really feels like musicians enjoy playing there. How did that come about? Think it’ll happen again? Other groups you might possibly open for? Justin: We’re not interested in overplaying the area or doing a show just cuz we get offered something. We want there to be a reason and for it to feel special. After tomorrow’s Mercury Lounge show we’re going to be adding some things and beefing up the show before we play again. Are you recording any new music? Full length album? Justin: We have another record we’re sitting on. We’re not convinced of a release strategy yet, but we’re always recording music and working on things. Its really varied in its sound. Bits of jamming we did in a few hours, or songs that took us weeks on end to finish. I don’t think the new recordings are very different than what we’ve done before, maybe a little more polished and thoughtful.